A large Clinical Skills room is located in the deeper plan along the east wing, with two dedicated store areas on the opposite side of the corridor and a new changing space adjacent to the existing space in the north-east core. The fit-out of this area replicates (albeit as a single space) rooms C208 and C210, which emulate hospital wards with curtained bed spaces, bedhead trunking, hoists and a sluice array. One teaching wall is provided with storage underneath. Clinical Skills rooms and bio-labs along the north wing have been retained and supplemented by additional space at Level 3 (see below). The VERT (Virtual Environment of a Radiotherapy Treatment room) spaces are located in the narrower side of the east wing preferring a long, thin arrangement as requested in discussion with the users. The facility consists of a projector room and teaching space with a screen dividing the two areas. The original installers (Virtalis) have relocated equipment to the new space. Full blackout is achieved by erecting a solid partition along the window wall with matt finishes to walls, floors and ceilings in line with manufacturer's recommendations. This room also houses the relocated laser gantry from the current CT scanner room in the basement of Drysdale Building. The relocated X-Ray Suite is situated in the quieter south wing and forms a cluster around a dedicated control lobby. The relocation of the specialist equipment and fit-out of these rooms was undertaken as a 'turnkey' package through equipment providers Siemens including lead lining, internal finishes and fittings. Final certification of the facility was coordinated by Siemens using the Radiation Protection Advisors (RPA) based at St George's Healthcare NHS Trust. LCS (Language and Communication Sciences) are located opposite the X-Ray Suite. This consists of a speech and gesture lab and a listening room accessed from its own dedicated lobby. The acoustics are critical to the operation of this room both in terms of reverberation within the space and transmission of sound from within the building and external sources. An acoustic consultant was appointed and a full report is available in Appendix D. An additional break out room to a less onerous acoustic requirement is also provided. Two PC labs provided in the east wing. Room C239 will be used mainly by Radiography and features a perimeter arrangement of computer benching. Room C244 features island pods, a meeting table and short run of perimeter desk space and will be used by LCS. The Optometry Physical Sciences Lab is reduced in size and has been remodelled to form seven distinct working booths. The Optometry Teaching Labs have been retained along the west wing but with a small remodel of an existing store area to create a Clinical Diagnostic Lab. In addition, the poorly used end of C204 is now partitioned off to contain the Clinical Practice and Discussion room relocated from C258. Ocular Optics, room C267: A large open plan area with curtained bays containing optical tables and a central storage zone. Psycho-physics, rooms C261, C263, C264 and C265: Existing long thin office spaces are retained with minimal alterations. Corner desks accommodate data processing using multiple PCs. 'Bath Street' research spaces, rooms C266, C270, C268, C269. Four spaces with a separate lobby area are created to largely replicate the spaces currently available on the 6th floor of Bath Street (currently used for 'screening study of equipment and its impact on eye care'). One space has been designed to accommodate new 'Octopus' equipment (an automatic projection perimeter for the examination of the whole field of sight). DC space (Measurement Techniques in Vision), room C274: One of the few spaces not requiring blackout, this area is designed as a flexible computer based lab with perimeter benching and a small break out area able to be used for small discussion groups without disturbing the general working environment. Photometry, room C259: This room contains a series of test equipment for colour vision assessment, photometric standards calibration, precision approach path indicator test and conventional colour assessment tests. Human Visiomotor control/Visual Electrophysiology, rooms C250/C251: These laboratories share a common waiting area and storage facility. The former room is set up to assess human responses via a series of linked wall-mounted cameras and the latter is shared by two researchers who run a series of visual electrophysiological tests using mobile equipment. Shared Clinical Lab, room C249: This space is a similar facility to the existing room C237 and includes curtained bays for a map test, sight test, and OCT. The room is also equipped with a sink and worktop. East wing John Barbur Labs, rooms C237, C242, C243, C245, C246, C247, C248: A series of two larger rooms with curtained bays and five smaller spaces all with blackout. A flexible arrangement of services has been provided to allow final equipment and furniture layouts to be accommodated. 'Wet' research labs in the NE part of the plan remain largely as existing. Doors from the Neurobiology Suite onto the stair lobby have been infilled with a new pass fire escape door inserted into C203. Research Support Areas, room C271 (workshop) and room C257 (store). 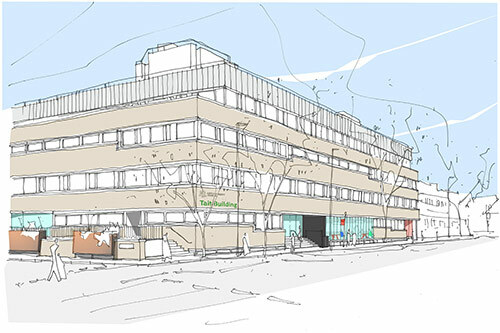 Additional research/hot desk areas, rooms C272 and C272a are two existing office spaces which will not form part of the scope of this project. These are intended to be used for hot desk areas or to house future research requirements. To supplement this facility the existing kitchen/staffroom can be used as a more informal break-out area. The north east corner has been remodelled and refurbished to create two new clinical teaching spaces similar in function to C215 and C216 on Level 2. These are located adjacent to the stair and core closest to the Level 2 clinical teaching areas to allow ease of movement between floors. The goods lift is also in this corner to allow equipment to be transferred as required. Level 3 has been substantially developed along the north wing to create lecture and seminar spaces displaced from L0 as a result of the SEMS project.